The Rabbi with a Blog (Rabbi Jason Miller): No More Pork in Washington! No More Pork in Washington! The White House koshered its kitchen ahead of its annual Chanukah reception. Petak Caterers, under the joint supervision of the Bergen County, N.J., rabbinical council and Washington representatives of Chabad, will serve Glatt kosher meat at the dinner Tuesday night. The meeting is taking place early because President Bush and much of the Washington establishment leaves the city around Dec. 25, when Chanukah starts this year. 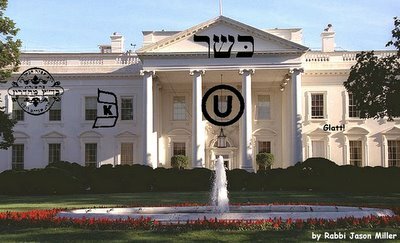 The White House said it was the first time that First Lady Laura Bush had handed over the kitchen to kosher caterers for a Chanukah celebration; previous kosher caterers brought food in from outside. “The First Lady said if the function is kosher, it makes it more comfortable for her guests, and it makes it more comfortable for her,” said Rabbi Levi Shemtov, Chabad’s representative in Washington. Bush will meet with Jewish educators before the party, which hosts a cross-section of the Jewish leadership.